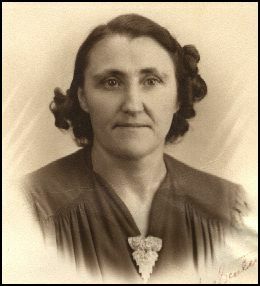 I know more about this grand parent than I do any other simply because she interacted with me and besides, she was alive when my other grandma died way before I was born. Even with this, I don’t know a whole lot about Gramma Shively. We all simply called her “Ma.” Her name was Theresa Milner. Sometimes it’s spelled with two L’s and sometimes with one. Sometimes Theresa is spelled with the “h” and sometimes it’s spelled with the “h.” I’m never sure which to type when I write her nane. Theresa had my mother on February 11, 1913. She married Roy Shively in 1915. I don’t have the exact date, but I have the year in Pa’s own handwriting. So she was 2 years old when they married. But Roy must have adopted her legally because he name has always been Kathryn Elizabeth Shively. 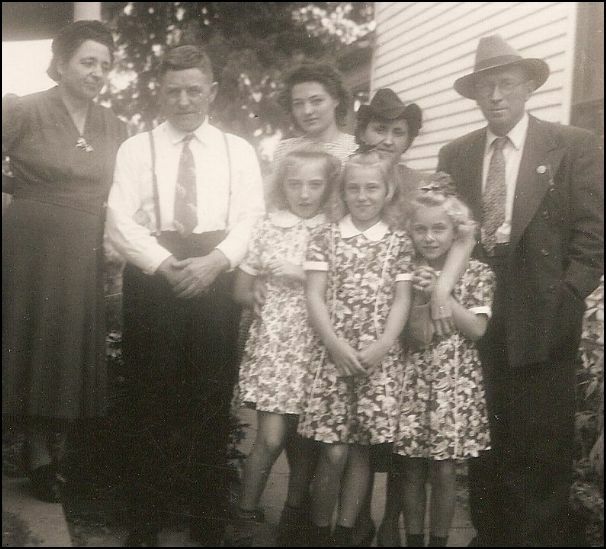 Gramma Shively, Theresa, was born in Vienna Austria. She came over to the United states around 1909. I found a couple entries in the Ellis Island immigration lists, but I have no idea if it’s her or not. There are so many entries it’s truly hard to be certain. The legend I heard about my mom’s birth is that Theresa came west from New York on a train and was empregnated by a conductor named Johnny Sousa (or Solis) and had the baby in Iowa. Other rumors were that she was staying with relatives who’s husband or father impregnated her. There are other rumors besides,so I really don’t know. I do know that my mother spoke only German until she started school in Omaha. Even in my early childhood days, I can remember Ma and my mother speaking German to each other. 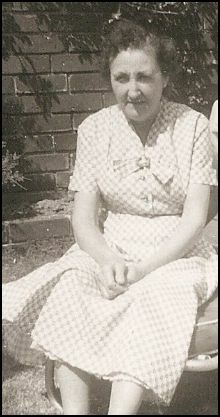 She was a stay at home mother all her life as were most women in those days. She delivered 9 children alive. I don’t think she lost any in childbirth or as children that I know of. All nine of her kids grew up to give her grandchildren. She loved the Grand kids and stayed busy keeping in touch with all of them. She’d come to Omaha because there were three or four of her kids that stayed here when she moved to California with Pa in the 1950’s. I remember her with us at meals on and off throughout my life. I treasure this small picture of me with gramma with our arms around each other. How cute is that! 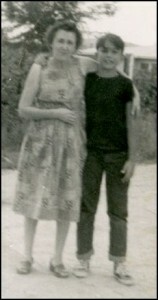 I’m just 12 years old in 1959 when we went to California to visit. There are quite a few movie clips on my home movies post with that visit, but I truly am glad that I got a personal picture of myself with Gramma. There were so many grandkids, that I truly felt honored to be with her. She was a wonderful woman. 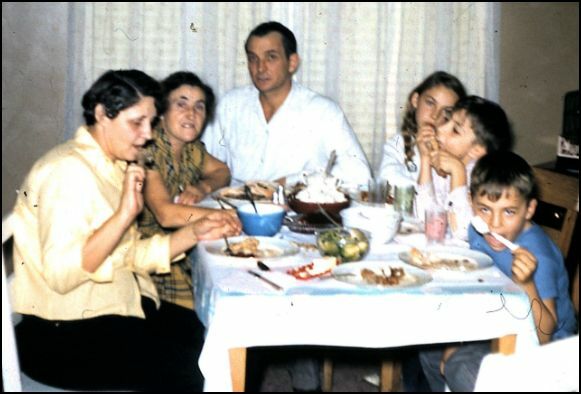 The only time I know of when all 9 of her children were together after many years was at her funeral in 1968. 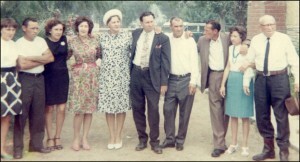 Moving from left to right the children are Beverly (the youngest), Roy Jr., Dorothy, Elsie, Katie (My Mom), Johnny, Lawrence, Freddy, Delores and then Pa is on the far right also. I’m sure everyone of the kids and grand kids has this picture. We don’t have any history of Ma. We don’t know who her parents were or anything about her heritage. I believe she had two sisters that came to the United states a little before she did, but I’m not sure. One of them married a Schieberhoffer, or something like that. I can vaguely remember going to south Omaha s a young kid for Mom to visit her Aunt. There were two of them and they were called Katie Dat (I think dat is german for aunt) and Rosie Dat. I should look them up sometime. Here’s a picture (far right) of Ma behind the three blond girls and Pa (Roy) with the Schieberhoffer (Spelling?). The lady on the far left is Katie’s sister, or at least one of them. I’d guess that the younger one in the back might be ther other one, but who knows. If you look at Rita’s wedding movie clips on this site you’ll see a lady come to the reception that looks a lot like this one on the far left but older. 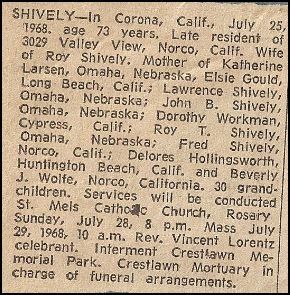 Gramma Theresa Millner Shively passed away on July 25, 1968. I don’t remember it at all to my shame! I was so busy being single and driving new cars that I just ignored it all.